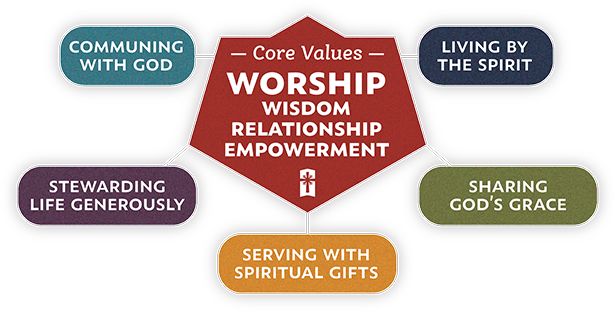 Our Core Values describe the kinds of people we are to BE in response to God’s grace in salvation, while our Discipleship Outcomes describe the things we DO in light of our Values. Our Core Values describe the kinds of people we are to BE in response to God’s grace in salvation, while our Discipleship Outcomes describe the things we DO in light of our Values. These are linked because we believe that our actions naturally follow what we value. Wisdom found in God’s Word and through prayer. Being generous with all of our lives to God in service to Him. Relationships will be Christ-like through selflessness, sacrifice, and forgiveness. Sharing God’s grace story with others, and serving them through spiritual gifts. through Bible reading and prayer. as seen in Romans 6:12-14, 8:1-11, and Galatians 5:22-23.
as compelled in 2 Corinthians 5:17-21.
as listed in Romans 12:6-8, 1 Corinthians 12:4-11, Ephesians 4:11-16.
for God’s glory as inspired in Romans 12:1-2.